fundamental Tuesday class. Serge covered 2 entries to single X guard: one for shin to shin guard and one from a standing leg takedown. 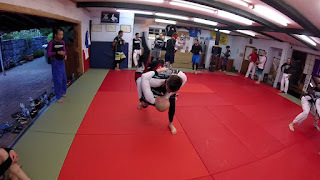 On Thursday night, Stu continued on the single leg X guard topic by adding a guard pass and also taught a knee bar from the kiss of the dragon move from reverse de la riva. Serge covered some more fundamental arm bar, arm bar defense, cross choke and cross choke defense. Please note that we no longer have BJJ Saturday class. Please note that last class for the year is Thursday 21 December 2017. We will restart on Tuesday 09 January 2018.